Each year since I’ve started Odori Park, round about this time of year, I’ve participated in the special webcomic charity to fight human trafficking run by Lora Innes and Crystal Yates. This year, I’m psyched to be participating again, and although the name has changed–to Comic Creators for Freedom–the mission remains the same: webcomickers around the Web create a fun joint work of art that’s available for download in exchange for a donation that goes to organizations that are working to stop modern slavery. 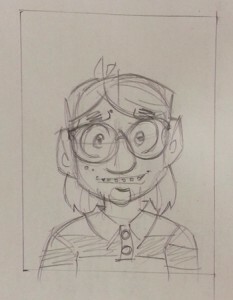 The donation drive will run from January 9th-20th, but cartoonists and artists can get involved right now by signing up to contribute a bit of character art to the collective illustration. Please visit the CCF site for details and to get on the list! Just an end-of-year post to give a preview of my artwork for the Comic Creators for Freedom massive webcomic wallpaper/collage. See if you can figure out the theme from what Arisa is up to here… And make sure you check out the CCF website immediately if you’re an artist who’d like to participate (deadline’s tomorrow!) and shortly after the new year if you’re a kindly soul who’d like to donate to the cause (and get your hands on the wallpaper; donation drive starts Jan. 9th). Whoo boy, is that ever a daunting title. What’s in the works for the year of the dragon? More comics, for sure. Hopefully you’re all enjoying them! I’m thinking about adding color, although I’m time-pressed as it is, and wondering how to pull it off. I’ve toyed with the idea to do a mini podcast (pod-ette?) or video blog-ette (baguette?). Something low impact but high on fun. I swear to all that is holy I WILL get prints up for sale. I think I said they’d be on tap a year ago, but what’s a little year between friends? Another book is definitely on my agenda (and I’m all ears to thoughts and requests). Any thoughts about what you’re planning for the new year, or what you think would be fun for O.P.? 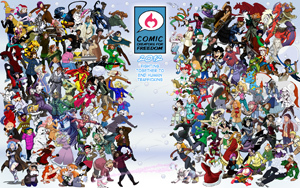 PS: Don’t forget, the Comic Creators for Freedom awesome wallpaper donation drive starts on Monday, Jan. 9th! The Donations Drive will last for two weeks, from Monday January 9th – 20th. All proceeds will be split evenly between Love 146 and Gracehaven House- two organizations working on rehabilitation of victims and prevention of this crime. Just a quick reminder that today, Jan. 20th, is the last day for donations to the 2012 Comic Creators for Freedom drive. Please consider donating a bit to help fight human trafficking (visit here to donate: comiccreatorsforfreedom.com). Donors receive a collaborative thank you wallpaper image drawn by over 100 individual comic artists (myself included). Thank you! 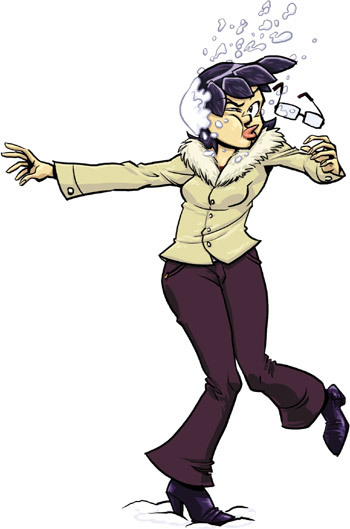 From 2009 through 2011, I participated in the Comic Creators for Freedom drive to combat human trafficking, which gathered donations in payment for a special wallpaper illustration created together by over a hundred cartoonists and artists. The drive was quiet last year, but they’ve brought it back around this year, and I’ll be participating again. As you may have guessed from the picture to the right, the theme this year is “Awkward School Photos.” Does this guy look at all familiar? 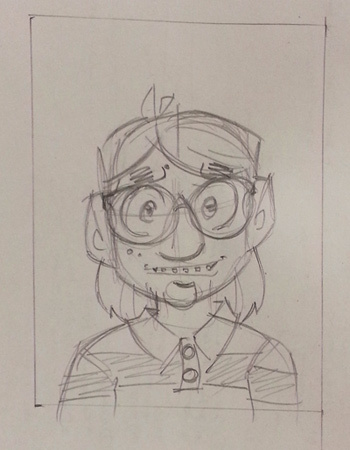 I’ve drawn Arisa in past years’ projects, but they’ve opened it up to male characters this year, so I’m giving Colin his time to shine (?) Thought I’d share an early pencil sketch before finishing the final artwork. 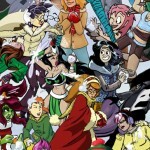 The donation drive itself will kick off on December 2 (International Abolition Day) at www.comiccreatorsforfreedom.com. The drive will run through Friday, December 14th, so you’ll have nearly two weeks to support Love 146–a charity that works to end and care for the victims of child enslavement and abuse. Starting today, Dec. 2–selected because it’s Internal Abolition Day–and running through the 14th, you can make a donation to Love146 and, in return, get a downloadable wallpaper created by 167 comic artists from around the Web. Love146 is an organization dedicated to stopping the spread, and caring for the victims, of human trafficking. 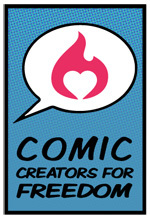 Please click here to donate at the Love146 site, and click here to learn more about Comic Creators for Freedom, the organization run by Lora Innes and Crystal Yates to put this effort together.